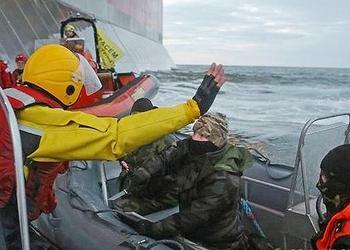 AMSTERDAM, The Netherlands, October 24 2013 (ENS) – Russia will not accept an international arbitration process under the UN Convention on the Law of the Sea at which The Netherlands is seeking the release of the Dutch-flagged Greenpeace ship Arctic Sunrise and its crew. The Russian Foreign Ministry says it will not attend the hearing at the International Tribunal for the Law of the Sea. At that hearing, The Netherlands will ask the tribunal to direct Russia to release the Arctic Sunrise and its crew and allow them to leave Russian territory. “Activists of the Greenpeace actions in relation to the platform Prirazlomnaya on 18 September violated Russian law on the exclusive economic zone and the continental shelf. A criminal investigation into the incident [is ongoing],” the Russian Foreign Ministry said in a statement Wednesday. The Netherlands claims that the arrest and detention of the Arctic Sunrise and its crew in September during a protest action off Russia’s northern coast took place in violation of the UN Convention on the Law of the Sea. On September 18 Greenpeacers used ropes in an attempt to board the Prirazlomnaya in protest against oil drilling in the Barents Sea. Russian law enforcement authorities arrested two activists at the scene. 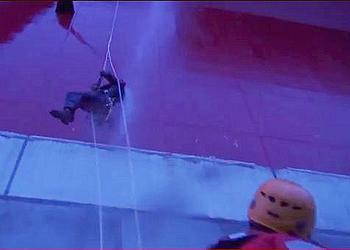 The next day the Arctic Sunrise was boarded by coastguard officials, brought to the port of Murmansk and detained. Thirty members of crew and journalists, nationals of: Argentina, Australia, Brazil, Canada, Denmark, Finland, France, Italy, Morocco, the Netherlands, New Zealand, Poland, Russia, Sweden, Switzerland, Turkey, Ukraine, the United Kingdom and the United States, were arrested and detained in Murmansk. The “Arctic 30” as Greenpeace has dubbed them, are being held in a Murmansk prison on charges first of piracy and now of hooliganism and have been refused bail. The Russian Federation ratified the UN Convention on the Law of the Sea, UNCLOS, on March 12, 1997. The treaty provides for compulsory third-party settlement of disputes over the interpretation or application of the convention. “It seems the Russian authorities don’t welcome the prospect of the lawfulness of their actions being assessed by an independent tribunal,” said Simons. The International Tribunal for the Law of the Sea, ITLOS, is an independent judicial body located in Hamburg, Germany, established to resolve disputes about the interpretation and application of the United Nations Convention on the Law of the Sea. The Dutch authorities initiated an arbitration case against Russia on October 4, and on October 21 called for ITLOS to indicate “provisional measures” pending the outcome of that arbitration. If the tribunal rules in favor of the Netherlands, the 28 Greenpeace International activists, freelance photographer Denis Sinyakov and freelance videographer Kieron Bryan could go free while they await confirmation of a Russian court date.